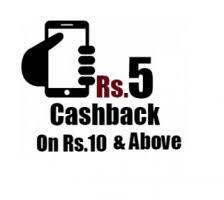 Paytm GET5: Get Flat Rs 5 Cashback on Rs 10 or Above Recharge [10 Times/Day], Now Paytm is back again with an awesome offer, where First 2 Lakh Daily users can get Flat Rs 5 cashback on Rs 10 or above on recharge/bill payment, so why are you waiting just avail the offer now, Hurry up. 1). Visit here to Goto Paytm websiteor Download Paytm App frorm here. 3). Then initiate a new recharge, enter number, select state and enter amount Rs 10 or above. 5). Then pay with the suitable payment method. 6). That’s it, you will get flat Rs 5 cash back in your account within 24hr.